3) What do you want people to take away from your scicomm activity? Your message. Now how do you now come up with a good giveaway? I have collected a bunch of points that I think are helpful to consider in this context. While giveaways don’t have to be physical objects, let’s assume that that’s what we want to give away, so people have something to take home with them, to look at, to use, to remind them of your scicomm activity or support them when engaging with your topic. So first, let’s think about what images come to mind that are relevant for your topic, then look at functions that might be connected to what you are doing. It’s likely that some thought has already gone into creating a logo for your project, or an acronym, or a key visual, or some sort of visual representation. But that doesn’t mean you have to stick with that; and if there isn’t anything like that — now is your chance to come up with something! Rapid ideation is a method that works well to come up with shapes related to a message: Come up with 30 different ideas for shapes or symbols related to your message, even if you don’t immediately see how they can be converted into a giveaway. Write them down, don’t stop before you have a list of 30! It’s amazing what you come up with once you get over the slump that happens after you’ve initially run out of ideas. Now this is what I think of as the fun part: Combining the functionality of whatever object you decide to give away with the message. Or rather the other way round — figuring out what functionality would work well to remind people of your message. In what context do you want the recipients to be reminded of your message? Depending on your goal, your audience and your message, you might want to bring it back to people’s attention at very different times. Going back to the fish example of the previous blogpost, you might want to remind people of what fish to buy when they are out shopping, or maybe when they are at home, thinking about what meal to cook the next day, or maybe even when at the office, planning tonight’s dinner. For each of those cases, you would use different physical objects as your giveaways (and which one you end up choosing should really depend on good research about your audience so you know they will actually use the giveaways in the way you envision). Here are a couple of examples (and there are probably tons more if you actually think about it): If you want to remind people of your message while they are at work, it might be a good idea to use office supplies, desk helpers, USB sticks, coffee mugs — objects that people regularly use at work. But remember, the assumption here is that this is when they make decisions about what fish to buy! If you think it’s more likely that those decisions happen when people are out, shopping, then using coin purses or those coin holders for trolleys or even canvas bags might be a better choice. And while fish-related cooking utensils are a cute idea (don’t you love kitchen gadgets?? ), it’s probably not the best timing for your scicomm, because the fish has already been bought at that point. What are functions related to the content of your message? I’ve been thinking about this in the context of two collaborative research projects people at my old job were working with, one on magnets and one on materials changing properties with changing temperature. Both of those have cool applications that can easily be used in scicomm. The one with the materials that change properties can do really cool things related to for example colors changing depending on temperature: there are all these cool “thermometers” like color-changing ducks that tell you the temperature of your bath, eggs that change color and tell you whether your eggs are soft- or hard-boiled, mugs that display different images when the contents are hot then if they are cold, or — my personal favourite — mood rings (!!!). Or if you want to make it about light changes rather than temperature changes, you could do these indicator strips for UV light that tell you when to apply sunscreen, color-changing nail polish (this actually exists! ), fairy lights with sensors that come on when it gets dark, … All of these things show versions of what the research project is all about, and make great giveaways that can either raise interest or remind people of having been engaged in some scicomm related to that topic. The collaborative research project that is all about magnets, on the other hand, could use anything related to attaching things to metal, pattern of iron filings in a magnet field, these little boards that kids have that you can draw on with a magnet. This entry was posted in #SciCommChall and tagged #SciCommChall, giveaways, scicomm, science communication on March 28, 2019 by mglessmer. Vernissage of water sculpture photography by Wlodek Brühl, with explanations of the physics behind the pictures by yours truly! I am a huuuge fan of Wlodek Brühl’s liquid art: Pictures of water sculptures that are created with focus on the tiniest of details, that only persist for milliseconds, but that are captured forever in all their fragile beauty. And I think these pictures are an awesome tool in science communication — I see so much physics in them (some of which I wrote about here already), and even if you come to an exhibition for the art, who wouldn’t love to learn some physics while they were there, too? 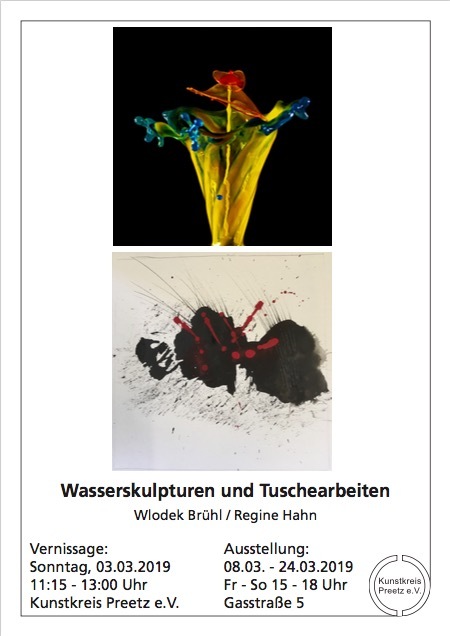 This entry was posted in #SciCommChall, observation, tank experiment and tagged #sciart, liquid art, water sculpture, Wlodek Brühl on February 19, 2019 by mglessmer. Yesterday on #scicommchall, I shared my elevator pitch. What do you think? 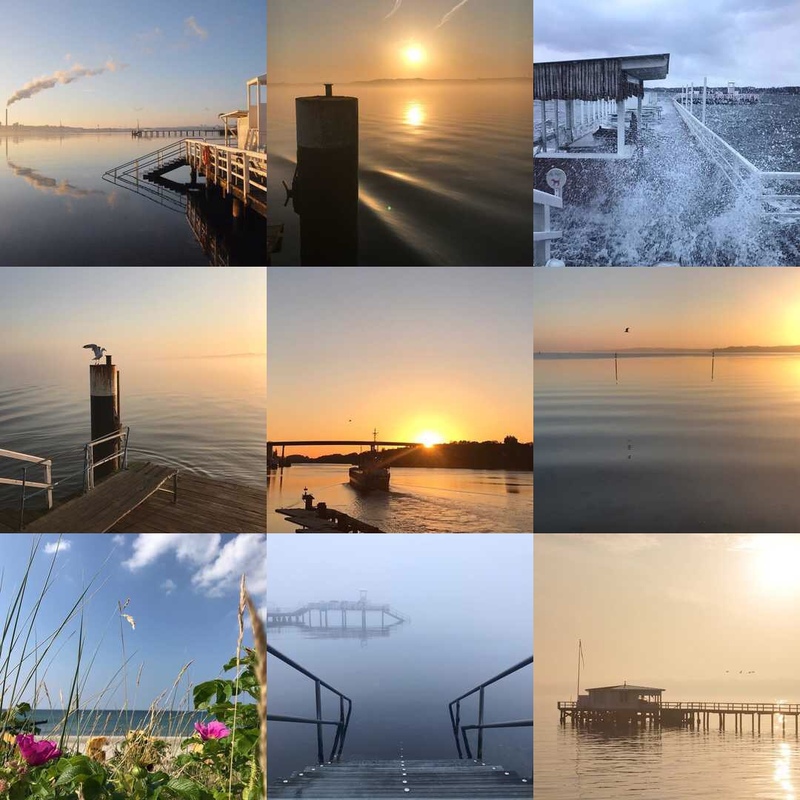 Does it make you want to learn more about GEO-Tag der Natur? This entry was posted in #SciCommChall and tagged #geotagdernatur on January 29, 2019 by mglessmer. So here are two versions, first one with English subtitles. But I am not done here, and my #scicommchall to myself remains: to write a better script, to film it in an elevator, and to upload it on the internet! :-) How is this #scicommchall working for you? Show me your elevator pitches! This entry was posted in #SciCommChall and tagged #geotagdernatur, #SciCommChall, elevator pitch, scicomm on January 11, 2019 by mglessmer. This entry was posted in #SciCommChall and tagged #2018bestnine, Instagram, Social media on January 9, 2019 by mglessmer. 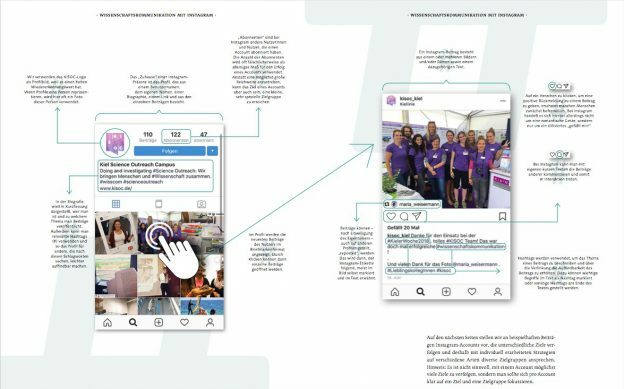 One of the 2018 achievements that I feel most proud of is developing a social media strategy for the science communication research project Kiel Science Outreach Campus, and implementing it together with the project’s 11 PhD students plus a couple more colleagues who we “entrained” along the way. And now an article we wrote about the whole social media has just been published! (pdf of the article and a link to the full issue No 4 of the IPN Journal). 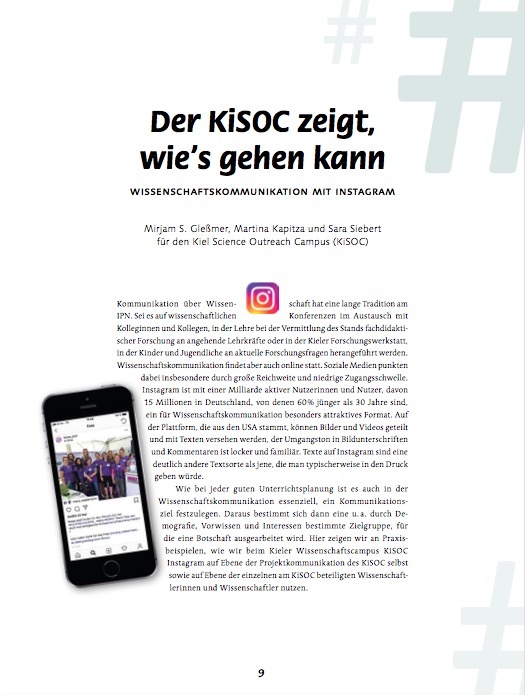 Check it out, as well as our Twitter @KiSOC_Kiel and Instagram @KiSOC_Kiel — both lead to the project’s central social media, which in turn often link to our individual scicomm social media profiles. A big Thank You to Sonja Taut for the super nice graphic design and print setting! This entry was posted in #SciCommChall and tagged Instagram, KiSOC, science communication, Social media, twitter on January 8, 2019 by mglessmer. Just in case you have not listened to Ronja and Maxie’s podcast Treibholz yet, you definitely should! 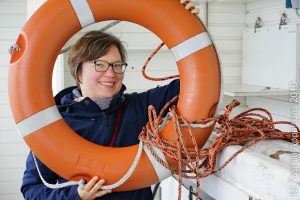 Ronja and Maxie are learning about oceanography and taking everyone along with them. Educational and entertaining to listen to! In the first one (actually their episode 15), we talk about what made me want to study oceanography, what drives the gulf stream, the importance of eddies in the ocean, and a lot more. In the second one, we talk about my favourite topic: Double-diffusive mixing! And then there are three advent specials, each approximately 10 minutes long, talking about being at sea on research cruises (1. Advent on why it’s awesome to be at sea, 2. Advent on what is being measured on oceanographic cruises, 3. Advent on what it’s like at sea). 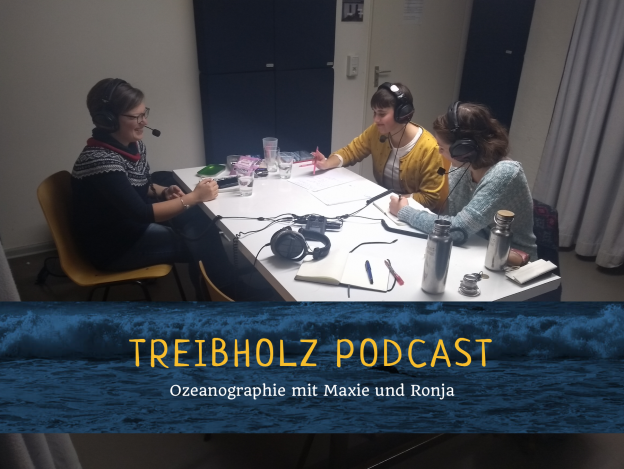 And now I am eagerly awaiting the new and exciting stuff that will happen on Treibholz in 2019, looking forward to listening to more oceanography with Maxie and Ronja! This entry was posted in #SciCommChall and tagged #SciCommChall, podcast, scicomm, Treibholz on January 5, 2019 by mglessmer.